The Ireland and Italy rugby union teams have a rivalry dating back to New Year's Eve 1988 when Ireland defeated Italy in a friendly, 31-15. 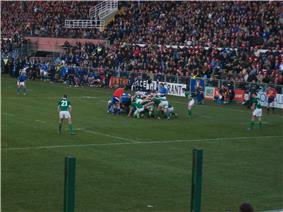 Ireland have dominated the meetings, with the Italians having achieved four victories. The teams' most recent meeting, was on 4 October 2015 in the Olympic Stadium in London where Ireland won 16-9.